• A bi-monthly newsletter and website provide a continuous source of information and communication. • Members have free advertising benefits via the newsletter and the OPW website. • Special awards annually recognize member(s) contributions in the furtherance of region goals. • Insurance coverage for Region events. • Annual Conventions provide members the opportunity to meet fellow enthusiast. • Awards and recognition of OPW members. • Advertising in the AACA Magazine reaches members worldwide. • Membership advertisement can be found in most hobby trade journals. *Free access to the worlds largest collection of Oakland-Pontiac reseach materials. *Free admission to the AACA antque automobile museum. 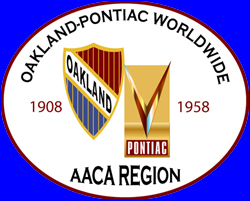 *Merchant discounts for OPW/AACA members.